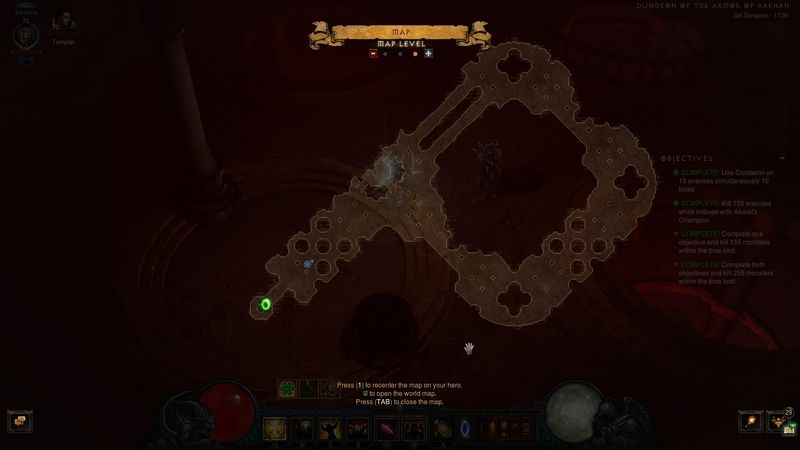 The Akkhan Set Dungeon is located in Act III, The Armory. Simply go to the Act III town, Bastion's Keep Stronghold, then head to the right and down of the town waypoint. Once inside, head downward to the lower room where Leah resides during the campaign. The entrance will appear if you have the Akkhan 6-piece bonus equipped. The Akkhan Set Dungeon's two unique Primary Objectives are to: 1) Use Condemn on 10 enemies simultaneously 10 times; and 2) Kill 150 enemies while imbued with Akarat's Champion form. The Akkhan Set Dungeon starts at a wide hallway, leading into a square-shaped main area. Your attempt path is fairly straightforward — clear the starting area, then do a clockwise or counter-clockwise run through the main hall. Morlu Invaders/Morlu Legionnaires — the bread and butter of your first Primary Objective, using Condemn on 10 enemies simultaneously 10 times. They come in great numbers and surround you quickly, whilst not dealing too much damage. Soul Rippers — coming in small numbers and with an annoying attack-dodge behavior pattern, Soul Rippers are not worth the effort to attempt a pull. Dispatch them on sight. Guardians of Akkhan — the unique enemies on the map. They resemble Act 4's Mallet Lord trash, but also have an Arcane elite affix. Because of their slow movement speed and easily dodged attacks, you can use them as extra fodder for Morlu pulls to fulfill the first Primary Objective. As with most Set Dungeons, a follower is not necessary and might get in the way more than help the situation. Don't be afraid to dismiss your companion. Allow the Morlu troopers to converge on you and use Condemn once. When first mortally wounded, Morlus remain at one hit's worth of health and, if left for a few seconds, regenerate. This allows you to use them for more than one big pull to complete the first Primary Objective, using Condemn on 10 enemies simultaneously 10 times. This is the more demanding of the two Objectives, so try to get it out of the way ASAP. Unlike any standard Condemn build, avoid using Blade of Prophecy (either cubed or in hand). The additional explosions provide extra damage that is more than unnecessary here, as they might finish off Morlu enemies before you can use them for a second 10-enemy pull. Unlike a Condemn progression spec, you may use the Unleashed rune over Vacuum to avoid pulling and killing too much trash at once, risking the first Objective. The second Primary Objective, killing 150 enemies while imbued with Akarat's Champion, naturally requires high uptime of this cornerstone Crusader skill. Do your best to reach the 56% Cooldown Reduction breakpoint to ensure its permanent uptime; remember that you can use a lot of shortcuts to achieve that, due to the low damage and toughness requirements of the Set Dungeon. The Fervor passive plus an equipped Swiftmount will net you easy 15% extra CDR. Standard Condemn build suggestions like a cubed Leoric's Crown apply in full force. You can even add an extra level 25+ Gogok of Swiftness and cube an Obsidian Ring of the Zodiac for additional CDR. 18 Feb. 2018: Added guide.